I finally had a cookie exchange!!! I have wanted to go to one or have one for a long time now. Read this. Since this summer and back-to-school was so carefree–haahahahahahaha!–I decided this was the year to have a cookie exchange. Had I lost my mind? Possibly. I invited all the ladies from church because I knew they would love me even if there was dust on my end-tables. Not everyone could come, but we had a pretty good turn-out. Some of them had never been to a cookie exchange either! I had fun getting ready for the party. 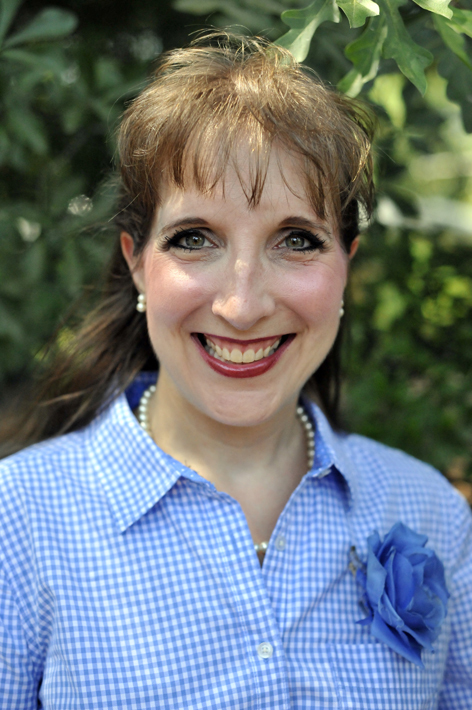 I even wore my “teacher” vest I made when I was an elementary school teacher in the ’90s. Don’t you love these vintage flip cards?! More below. I found these adorable notebook paper napkins in the $1 bin at Target several years ago with the intent of having a back-to-school cookie exchange! Can you believe it?! I provided some recycled Sister Shubert aluminum pans for the ladies to haul their cookies home. Gab–we did LOTS of this! We filled up this giant chalkboard with our kids’ names and schools. Some shared verses of encouragement. At the end of the night we spent time praying for the students as they were starting school. For some reason my colored chalk only showed up white. I guess it was the cheap kind. I asked the ladies to bring an appetizer as well as cookies. I made these spinach balls. It was a recipe from library cookbook. Sorry, I don’t remember the name of the book. Really, I’m not sorry. These looked cute but didn’t taste all that good. And the cute part was MY idea. The spinach balls had Stove Top stuffing in them. Guess they just tasted a little too processed. I thought the pretzels were a cute idea and made the spinach balls finger-friendly. As time went on, however, the pretzels got soggy. Points for cuteness. Negative points for flavor and sogginess. I’m not making THAT recipe again! Thank goodness Nicole brought her yummy Spinach Dip! Jami made yummy guacamole. She brought it in a Tupperware bowl, so she tried to fancy it up with the napkins. We all laughed pretty hard at her! Tammy brought these amazing ham and cheese sliders. I’ve made these sliders before but not like Tammy’s. She put soy sauce and brown sugar on the top. OH MY WORD! So yummy! Someone already had labels on these cookies. The little cookie name plates were left-over materials from a project similar to this one. Some of the cookies were store-bought, which was just fine. All of the cookies were delicious! I’ll have to check back with the ladies about the recipes. I’ll be sharing the recipe for my cookies, the Flu Fighter Cookies, soon. What a fun time! We may have to do it again sometime. What do you do on May 4th when your kids are super into things like super heroes and Star Wars? 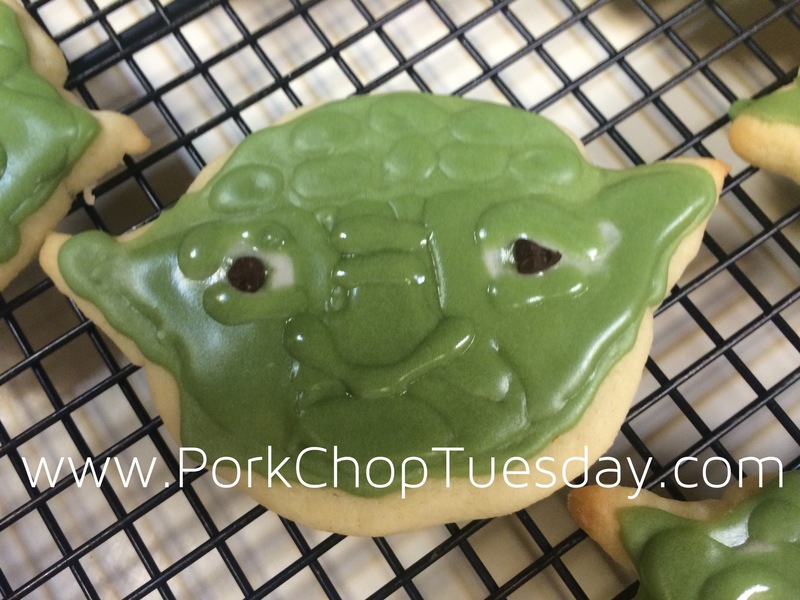 I am amazed by some of the fancy cookies I see out there on the Internet. I dream about being able to make fancy cookies like that some day. 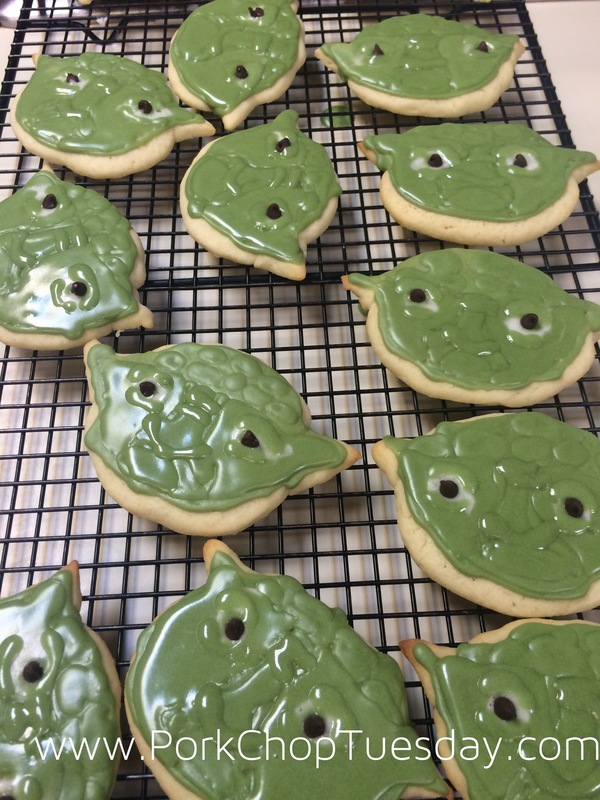 I wanted to start out this post by saying, I tried to make some Yoda cookies for “Star Wars” day. Then I remembered the words of Master Yoda… It’s a learning process, I suppose. You only get better if you practice. 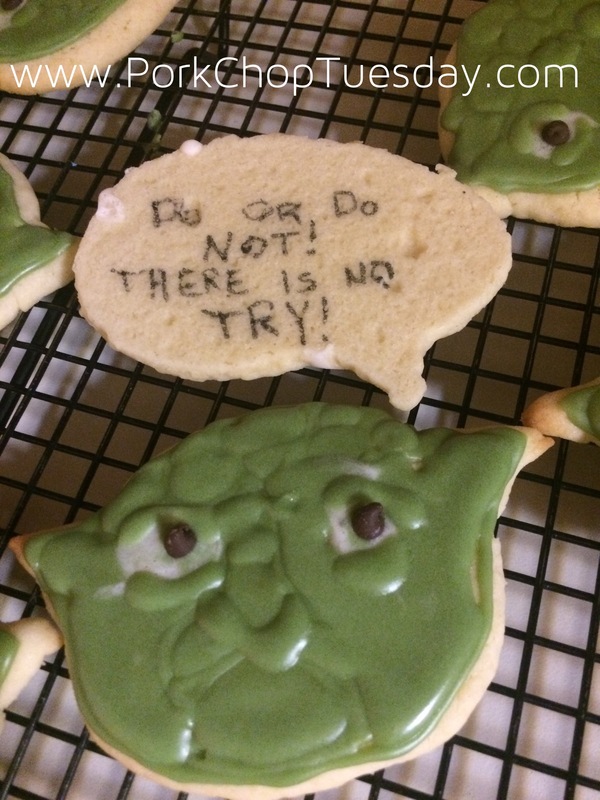 So, I made some Yoda cookies for my kids. I just cut a circle and kinda squished it into an ovalish shape. Little triangles were stuck to the sides for ears. Here is the pattern I followed for decorating. I LOVE Sugarbelle’s cookies-all of them!!! Shortbread cookies are no stranger to a tea party. Add a little cocoa powder and this simple, unassuming cookie goes from wallflower to star! Okay, that may have been a little dramatic. We are, after all, talking about a cookie. I did amp up these chocolate shortbread cookies a little by making my own cookie stamp just for the occasion! I experimented with stamped cookies about a year and a half ago. Click HERE to see that experiment. Can you tell what I used to make the stamp? I just glued the letters onto a piece of cardboard–in reverse order and backward! I even made a little handle with stacked pieces of cardboard. For some reason the “M” was a little thicker than the other letters. It did the best after baking. Perhaps because it smushed into the dough deeper. Some of the thinner letters were a little tricky to read. I think people got the point though. I used Martha’s recipe from her Cookies Cookbook. Well, I didn’t follow her recipe exactly. She calls for drizzling the shortbread with melted white chocolate. That obviously wouldn’t work with my fancy stamped cookies. It sure sounds yummy though. I may have to try that next time. Pulse all the dry ingredients together in a food processor. Add butter and vanilla, and process until it all starts to stick together. Shape into a ball. Roll out on a floured surface to about 1/4 inch thick. Cut however you like. I used a garnisher that had a wavy edge to cut my cookies into small sticks. I did a bit of experimenting to get the size just right for my stamp. I even trimmed some off after I stamped because I just thought they looked too wide. Go with what you like! Bake on parchment paper. I’m terribly sorry, but since my cookies were so small, I just guessed at how long to bake them. I crammed a bunch on my baking stone because I was lazy and didn’t want to make 800 batches! Martha’s recipe says for 3 1/2 x 2 1/2 inch cookies to bake for 20-25 minutes-until firm to the touch. I’m thinking I checked mine at 10 minutes. Sorry, I just don’t remember how long they took. I had just baked so much! I had flour for brains! They turned out great–however long I baked them! They were very yummy! I neglected to get a good picture of the cookies after they had baked. You can barely see the corner of one on the picture below.